The 20 VarTarg is a popular wildcat based on the .221 Fireball case necked down to 20-caliber. Amazingly efficient, the little VarTarg will drive 32gr bullets at 3700 fps with just 18-19 grains of powder. This is an inherently accurate round that delivers impressive velocities with small powder charges. Burning less powder (compared to a .204 Ruger for example), translates to cooler barrels and longer barrel life. “I’ve gotta a 20 VT…cannot put it away…it’s a recycled 204 Pac-Nor barrel with 1:12″ twist and finished length of 24″ screwed into a single-shot Savage AccuTrigger action. [I get] 3636 fps with 40gr V-Max. I’ve tested the new 32 NBT, but the 40-grainer has more downrange effect. This little cartridge will pick p-dogs off the ground and flip them in the air, even at 400+ yards. I’ve run 500+ rounds down the VarTarg tube, so now this barrel is pushing 3000+ rounds. Load development using H4198 and H322 both produced .50″ or better for 5 shots @ 100 yards. But the weak link is the Rem 221 Fireball brass.” — Dogbuster (Rifle shown below). Our Forum members report that .221 Fireball brass is very hard to find right now. This is related to Remington’s introduction of the 17 Fireball loaded ammunition. If you can find a stash of .221 Fireball brass, grab it while you can. It may be many more months before ample supplies of .221 Fireball brass make it to the retailers. 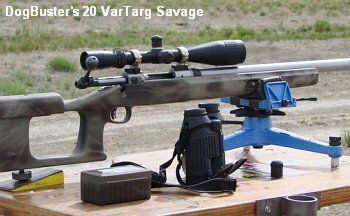 To learn more about the 20 VarTarg, read our 20 Caliber Cartridge Guide. Share the post "20 VarTarg Performs, But Brass in Short Supply"
Sixty-eight years after Bob Brownell hung his shingle as a gunsmith, his grandson, Pete Brownell, was named the president of Brownells, Inc. as of January 1, 2008. Former company president, Frank Brownell, continues to serve as chairman and chief executive officer. “Dad founded the company on the foundation of providing customers unsurpassed service, selection and satisfaction,” Frank Brownell commented. “I’ve done my best to carry on that tradition. I’m positive that as Pete transitions into his new role, he’ll continue to put our customers atop his priorities.” Officially joining the company in 1998, Pete spent nine years in his previous position as Brownells vice president. Brownells is the world’s largest supplier of firearm parts, tools, equipment and accessories. For more information, call (800) 741-0015, or visit www.Brownells.com. Share the post "Pete Brownell Named President of Brownells, Inc."